pretty.pretty.paper: i just look at the pictures. have you ever heard of brian dettmer? 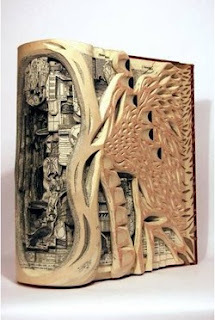 he makes beautiful sculptures from books. in fact, the cover of that book may be one of his pieces. you know i think you might be right! i heart him very much!! the domino book of design! also island living by india hicks...thats my favorite for sure. also, have you been to william stout in sf?? ?